This new Python Data Science Toolbox (Part 2) course with case study by Hugo Bowne-Anderson will introduce you to the wonderful world of iterators and comprehensions. We're launching our new course Python Data Science Toolbox (Part 2) by Hugo Bowne-Anderson. 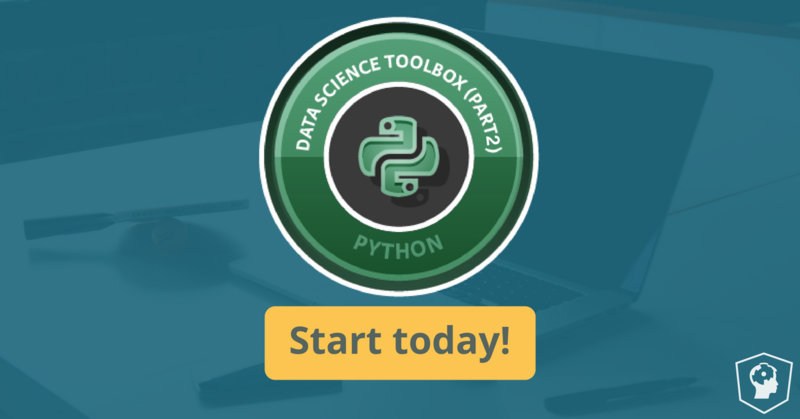 In this second course in the Python Data Science Toolbox, you'll continue to build your Python Data Science skills. First you'll enter the wonderful world of iterators, objects that you have already encountered in the context of for loops without having necessarily known it. You'll then learn about list comprehensions, which are extremely handy tools that form a basic component in the toolbox of all modern Data Scientists working in Python. You'll end the course by working through a case study in which you'll apply all of the techniques you learned both in this course as well as the prequel. If you're looking to make it as a Pythonista Data Science ninja, you have come to the right place. Data Science Toolbox part 2 features interactive exercises that combine high-quality video, in-browser coding, and gamification for an engaging learning experience that will make you a master at Data Science with Python! In the first chaper, you'll learn all about iterators and iterables, which you have already worked with before when writing for loops! You'll learn about some very useful functions that will allow you to effectively work with iterators and finish the chapter with a use case that is pertinent to the world of Data Science - dealing with large amounts of data - in this case, data from Twitter that you will load in chunks using iterators! Start first chapter for free here. Next, in chapter 2 you'll build on your knowledge of iterators and be introduced to list comprehensions, which allow you to create complicated lists and lists of lists in one line of code! List comprehensions can dramatically simplify your code and make it more efficient, and will become a vital part of your Python Data Science toolbox. You'll then learn about generators, which are extremely helpful when working with large sequences of data that you may not want to store in memory but instead generate on the fly. Finally, the last chapter will allow you to apply your newly acquired skills towards wrangling and extracting meaningful information from a real-world dataset - the World Bank's World Development Indicators dataset! You'll have the chance to write your own functions and list comprehensions as you work with iterators and generators and solidify your Python Data Science chops.